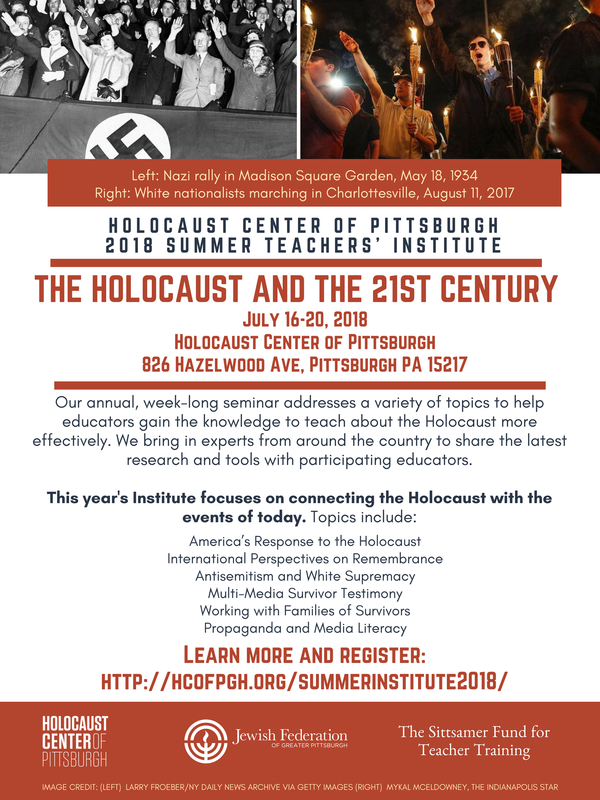 Our annual, week-long seminar addresses a variety of topics to help educators gain the knowledge to teach about the Holocaust more effectively. We bring in experts from around the country to share the latest research and tools with participating educators. Monday (7/16): Nazi Propaganda and Media Literacy, taught by Mary Johnson from Facing History and Ourselves, gives educators tools to help their students become savvy consumers of media in the age of online news sources. Tuesday (7/17): America’s Response to the Holocaust, taught by Rebecca Erbelding from the United States Holocaust Memorial Museum, discusses what Americans knew, and how they reacted in the face of the Holocaust. Dr. Erbelding will be discussing her new book on the War Refugee Board and USHMM’s newest Exhibit, Americans and the Holocaust. She will also be leading a public talk that evening. Wednesday (7/18): International Perspectives on the Holocaust, taught by Avi Ben-Hur from Classrooms Without Borders, examines how Holocaust education in America varies from that of other countries; laws in other countries that protect and/or jeopardize Holocaust remembrance. Thursday (7/19): Multimedia Survivor Testimony, taught by the Holocaust Center of Pittsburgh staff, illustrates different ways to connect a 21st-century audience to survivors in a manner that is compelling and accessible to all. We will discuss our popular Generations program, our collection of recorded testimonies, and CHUTZ-POW!, our original comic book series. We’ll also be unveiling our new Teachers’ Resource Guide that will help educators use the comic books in their classrooms. Friday (7/20): White Supremacy and Anti-Semitism, taught by Dr. Daniel Burston and Dr. Matthew Schneirov from Duquesne University, connects Nazi racial science to American eugenics and speaks to the impact of intergenerational trauma. The cost to attend the full week is $200. This includes meals, a copy of Flares of Memory, copies of all three volumes of CHUTZ-POW!, Act 48 filing, and five days of expert speakers from across the country. If you wish to register with the Scholarship Rate, please contact Christina Sahovey at csahovey@hcofpgh.org or 412-939-7289, and she will register you. Do not register yourself using the form. This program made possible with generous support from the Sittsamer Fund for Teacher Training.